On the north-west margin of Scotland’s Cairngorm Mountains lies Glen Feshie – since 2006 the scene of an ambitious landscape-scale programme of nature conservation. The large population of red deer is now being actively managed to support rejuvenation of native flora and fauna. Spectacular changes have already been observed in the first ten years, with carpets of Scots Pines blanketing parts of the floodplain and dramatic growth in numbers and species of birds, e.g. improvements in the black grouse and capercaillie populations. Here in Dundee, our interest is in the meteorology and hydrology. Most of the 230 km2 catchment is owned and managed by Wildland Limited. With the exception of some pockets of commercial forestry planted in the mid-20th century, most of this catchment is devoid of trees. The reduction in deer numbers is facilitating a rejuvenation of the native tree cover, and it is our aim to quantify the changing inputs and outputs of the river catchment over the coming decades, to allow changes in the hydrology to be understood, especially water balance and catchment response. Such change can only occur on a decadal scale, but the monitoring in place allows for a number of current projects to be undertaken now. At altitudes in excess of 900 m OD, upper slopes within the Feshie catchment are of crucial habitat value as the effects of climate change advance. 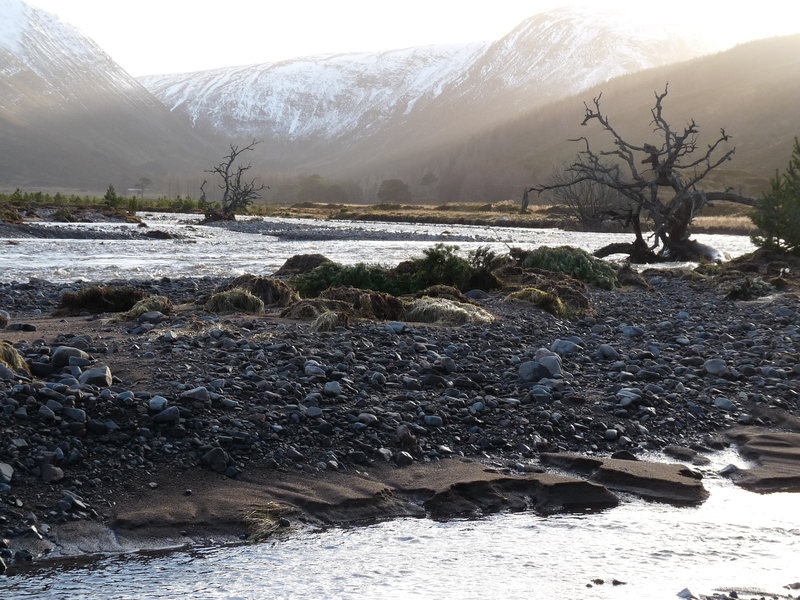 Our monitoring data are intended to assist studies of the ecology of the Cairngorms as well as local hydrological interests. We gratefully acknowledge the support of Wildland Limited, landowners of the Glenfeshie Estate, for their support of our current monitoring and research. We also acknowledge support and assistance of members of the Cairngorm Gliding Club, located in lower Glen Feshie.